This one-of-a-kind Permaculture Design Course (PDC) is a unique opportunity to gain hands-on ecological design experience while studying with leading permaculture designers and educators from the northeast. Gather the skills to design for abundance in your home landscapes and resilience in your communities. Visit numerous permaculture demonstration sites. Participate in a guided ecological design project for real clients at residential and village sites around Shelburne Falls, MA. Tap into extensive resources and inspirations. Network with fellow ecological thinkers, gardeners, artists, activists, change makers, and planners. Participate in the development of our new land project and ongoing community permaculture demonstration sites in the village. Join us for three informative and dynamic weekends! 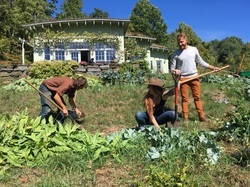 ​* This Sowing Solutions Permaculture Design Certification Course in Western Massachusetts is celebrating over a decade of Permaculture Education. * This course provides an opportunity for you to gain direct permaculture design experience. Participants conduct a guided design practice alongside leading permaculturists from the northeast. * We visit numerous well-established permaculture demonstration sites to study thriving ecosystems, water harvesting, community structures, natural buildings, energy efficiency, and more. * Gaining your internationally recognized certification with Sowing Solutions is an experience of empowerment, support, inspiration and skill building. * Optional: Apply 3 or 4 college credits to your degree program with our course affiliation to UMASS Amherst and the Five College Consortium. * Applications for partial scholarships and work trade discounts are available. * All techniques, skills, and resources that you learn and gather in this course can be directly applied at your home. ​Course Format: This Permaculture Design Certification Course is offered twice a year with Sowing Solutions Permaculture Design & Education in Western MA, USA. ​This course is offered as a weekend course format over a total of three weekends. You can attend either the fall or spring series. The Certification: A Permaculture Design Course Certificate signifies that one has completed a 72 hour design course, a study of the ethics, principles, and design practice of Permaculture. It means the holder of the certificate holds applied permaculture experience and a profound toolbox of permaculture techniques, strategies, solutions, resources, and skills. Our permaculture course offers 100 hours of permaculture study and practice. Our Course Location: We are thrilled to be offering our course at the local and inspiring Sowing Solutions Permaculture Community Hub in downtown Shelburne Falls in Western MA — our new studio and meeting space along the Deerfield River! It’s the home of Sowing Solutions Design & Education, and will be the design studio where students conduct their work for clients during the guided permaculture design process. Shelburne Falls is famous for the Bridge of Flowers and is home to many avid gardeners, artists, farmers, and craftspeople. There are a number of community and residential sites where students will have an opportunity to design and install permaculture projects! Our weekend series courses are be offered April-June or September-November. Gain your certification by attending this long-standing program! Students of this one of a kind educational event will visit numerous permaculture demonstration sites in the Western MA region. Register today for the Permaculture Design Course! Request the detailed Course Information Packet and registration materials here.